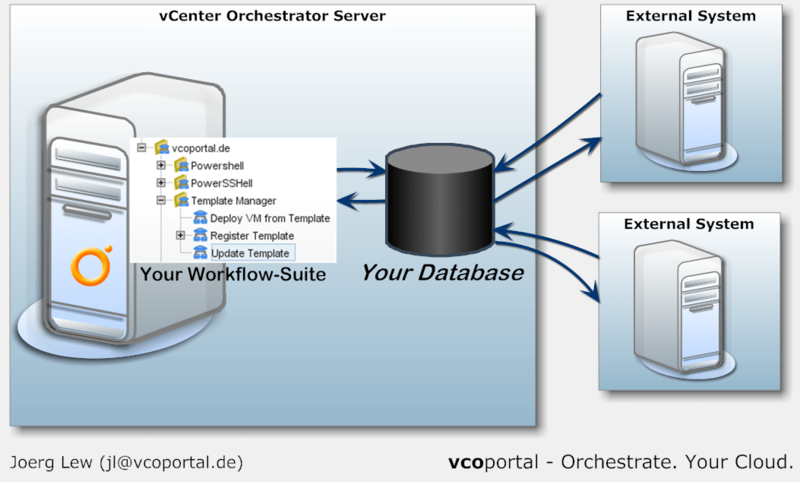 VMware Orchestrator allows you to access SQL-Databases from within workflows. This post shows you common Use-Cases for that, explain technical background and introduces three-and-a-half ways how to implement the database-access. 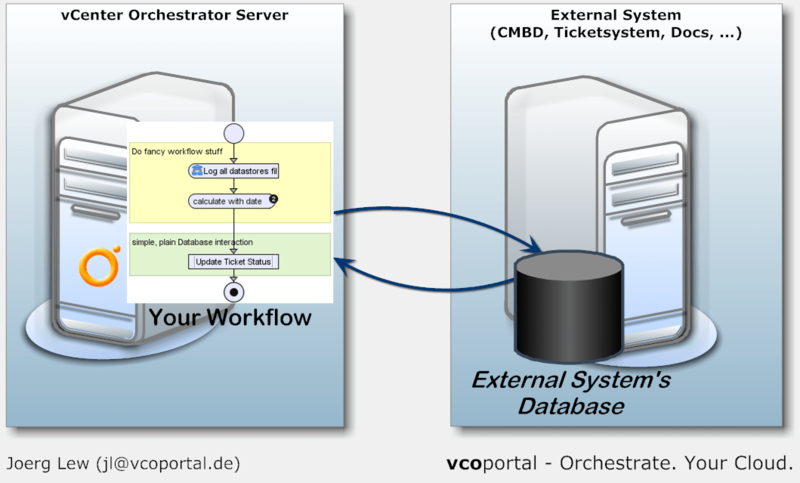 …integrate Your Workflows with external systems: You can retrieve or update information for an external system’s database (Ticket-System, Asset Management, CMDB, Documentation, Your VM-Deployment-System, …. …build Your very own database-driven solution: If you create a larger “Suite” of workflows (like the VM-Deployment-System), expect that you have to deal with more and more metadata around the objects your workflows handle. A database is a good place to store this metadata, and it allows external systems to integrate easily with your Workflows in future. …the bundled Database-Plugin. 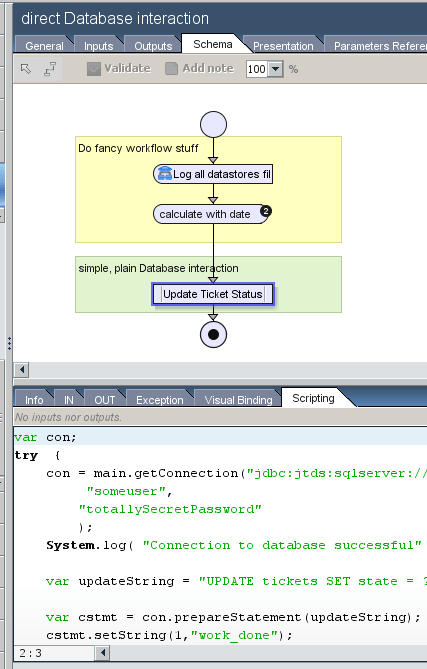 It provides a couple of Scripting-Objects for JDBC-Connections. So when you look for further reference information you can google for JDBC-Examples, they will fit (with some small limitations: Check the API Explorer of the vCO-Client to figure out the actual properties and methods of the JDBC-Objects). In the bundled Workflow-Library you also find a Folder “JDBC Examples”, which provides a complete typical “lifecycle” of a database. Here you can also find a very useful Workflow called “JDBC Url Generator” which creates the correct complete JDBC-Connection-String you need to connect to the database. Out-of-the-box, vCO supports Microsoft SQL-Server and Oracle-Databases, because for them the JDBC-Driver are pre-installed. 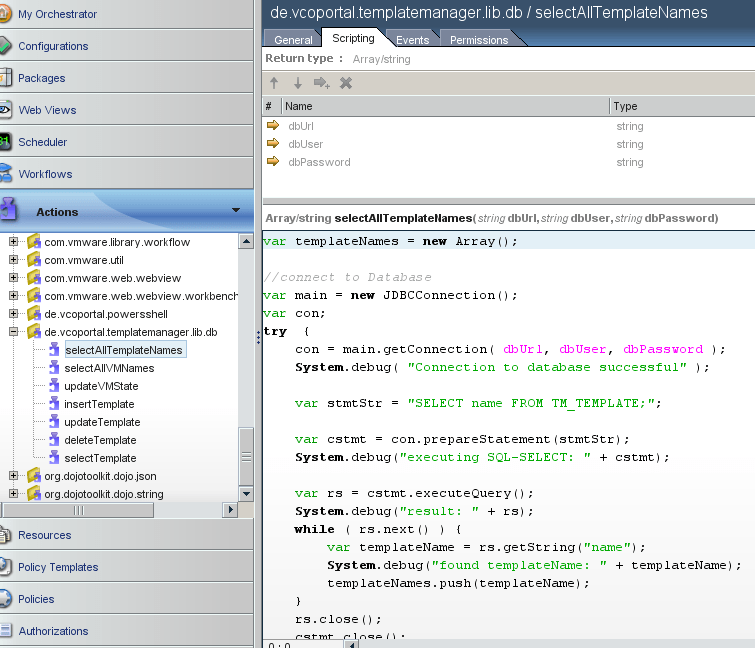 However, it’s possible to add any other vendor’s JDBC-Driver; to get an idea, how to do this, see http://www.vmware.com/files/pdf/techpaper/vco-experimental-dbs-openldap-support.pdf. When you need database-calls more often in your workflows (Acutally, you should use this if you need it more than once :-)), you should encaplusate the database-calls into Actions. Typically you create pretty generic Actions for each CRUD-Operation, sometimes additional some “higher-level” Actions which do exactly the call you need often in the workflows. (Side note: I call them DAO-Actions, compared to “Data-Access-Objects” in Software Engineering, when it comes to persistence and object-relational mapping in object-oriented software design. So you create a single point/module, where all the database-related stuff is implemented. This makes it easier to do DRY-style developing, and rises the readability, re-useability, and maintain-ability of your works. Consider the table-schema of the database you access is changing, so with DAO-Actions you only have to change the code in a single place. This is the “and-a-half” option, because it can be used in addition to the options above: JDBC allows you to call Stored Procedures of the database. This can be used e.g. if the vendor of an external system provide a bunch of Stored Procedures as an “API” for its database (or if you just want to pass all the SQL-work to the database-team ). See an example how to call a Stored Procedure in vCO. The final option is the holy grail: Build Your own Plugin for the Orchestrator, which handles the integration to the external database. This of course is some effort, but it’s worth it if you integrate your workflows very frequently with this external database (or of course, if you build your own database-driven workflow-suite, see the second use-case above). On the other hand: You don’t need to develop a single line of Java-Code for the plugin 8-), and let the automatic Hibernate-Mapping-Feature of the Database-plugin do the work for you. 2. Create real Java-Objects in the Plugin and use the full vCO-Plugin API. This allows you to present your database-entities as real objects to the Workflows and Actions, and adds the full functionality of the API (like Triggers, …).